Everyone likes to dress up their desks and it is fun to bring a little of the outdoors inside. Succulent arrangements can be chic or playful. Jurassic Park dish garden anyone? You may want to make one with a holiday theme by mixing in tiny holiday ornaments. Go hunting for unique containers. Succulents are simple to grow with a little care and knowhow. They only need a small amount of water about every 10 days or so. . Good drainage is a must. Always use Cactus Mix, Cactus! soil. A trick to find out if your plant needs water is stick a dry toothpick into the drainage hole at the bottom of the pot. If it comes out dry, it’s time to water. If there are bits of soil stuck to it, wait a few more days. It’s exactly like testing to see if a cake is done. Always put them in the sunniest place possible. That can be tough in an office situation, unless you have that spacious, corner office. Happily, they’ll respond to that florescent light above your desk. LED light is fine too. Plant several is one container to create a contemporary design. They would also be easy to combine with other succulents in a dish garden. Fertilize a few times in spring and summer to keep them happy. They grow 6 to 12 inches tall and wide. Albuca has a unique growing habit. It produces a thick bulb above ground. Thin grassy foliage rises from the bulb and blooms with green and white flowers. Try growing them with small succulents like Echeveria elegans. They grow 8 inches tall and wide. Echeveria is a small succulent, just a few inches high. The overlapping leaves of this echeveria species are beautiful in color. A greyish brown base with light pink and purple highlights creates contrast between the leaves. In the summer, the flowers can become coral to red with a yellow interior. 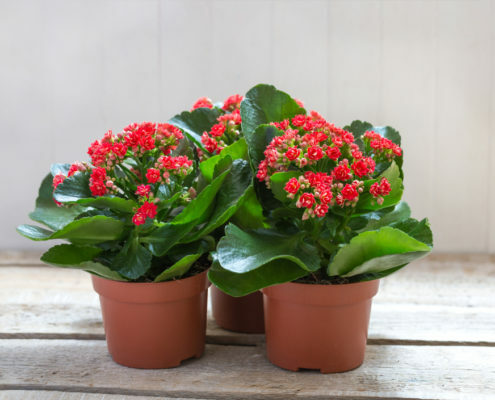 Kalanchoe is a beautiful succulent that can have colors of red, cream, and even yellow in its large, round leaves. No wonder they call them flapjack plants. One plant is all you’d need to create a show stopping display. It grows 1 to 2 feet tall. A big name for a small plant but the deep green leaves with white stripes really is a stand out. They look brilliant on small containers top dressed with a layer of five white gravel. They don’t like direct light so they work especially well in an office setting. They grow 2 to 8 inches tall and wide. From crayon stick figures to loud burps, Moms are notorious for thinking anything their kids do is cute. This Mother’s Day, brighten mom’s day by giving her a plant that’s just as unique as you. And if you choose the right plant, it will last for years to come. From succulents and cacti to brilliant foliage plants, there is a plant that will bring some extra sunshine to her life every day. She knows you better than anyone else, so remind mom just how awkward and quirky you were as a child. The low-maintenance, euphorbia obesa, comes in a baseball-like shape. Perhaps it’ll remind mom of your little league days. This is a cactus, so it simply needs a warm climate, light and a well-draining soil such as Espoma’s Cactus and Succulent mix. Crassula umbella is perfect for the mom who loves taking trips to the vineyard, with her children of course. When it flowers, this plant can grow up to six inches tall. This succulent likes well-drained soil and dry roots, so don’t overwater. Remind mom of your playful nature with a donkey tail plant. These succulents drape over containers in a trailing way. With their grey-green tear-drop shaped leaves, the “donkey tails” can grow up to two feet long. Flowers with small blossoms in red, yellow or white will emerge in late summer. Place these sun-loving succulents near a sunny window and water weekly during spring and summer. If mom’s always saying you’re getting on her nerves, try getting her an actual nerve plant! Also known as Fittonia, the name ‘nerve plant’ comes from the attractive pink, red or white veins that run throughout the plant’s rich green leaves. Their bright coloring and great patterns will surely ease mom’s nerves every time she looks at it. This plant also makes a great addition to a terrarium. Place it in a space where it’ll receive medium to low light. Too much sun can cause leaves to crisp. Water the plant weekly, when the soil starts to dry. Nerve plants need regular fertilizing, use Espoma’s Indoor! Liquid fertilizer to encourage new growth. Yes, more traditional moms might prefer something like an exotic orchid or a lovely pink succulent, but the above are sure to make her smile. Visit your local garden center to find the right plant. Want to do something different from mom? Try this hand print planter from Garden Answer. Terrariums make great additions to any room. There are endless options for variety, decorations and plants. They can be assembled in minutes and will continue to be enjoyed for months. They can even match this season, like these adorable winter snow globes! Whether you’re a terrarium expert or just making your first one, here are six easy steps to follow again and again. First, envision the terrarium you want. Where will you place it? What kind of plants are in it? What type of container will you use? Does it have a lid? Once you’ve got an idea, visit your local garden center to find many of the materials needed to make a terrarium. The first layer in your terrarium will be for drainage. Add about a 1-inch layer of sand, rocks or pebbles at the bottom. This ensures that water will not linger in the soil and will help to prevent root rot. Add about ¼ cup of activated charcoal to the terrarium to help keep it healthy. The charcoal helps the water stay clear of buildup and microorganisms that can grow on any living thing. Add an adequate amount of soil for your plants. Dig a small hole to place the plant in. Choose a few standout succulents or add as many plants as you’d like. Make sure each plant has room to grow. Remember to leave some space to add in creative elements. Once your terrarium has plants, it’s time to add the finishing touches. Layer different types of ornamental mosses or decorative stones to enhance the look. If you’ve got fairy garden elements, add them in now. If you’re adding any pieces that you may have brought in from outside, make sure to rinse them off well first. You might find it’s easier to use a set of tweezers to place these pieces in smaller terrariums. Help your terrarium plants stay healthy and strong by feeding with the proper Espoma liquid fertilizer. Enjoy! Switch up your terrarium whenever you feel like you need a change or new plants! When Life Gives You Lemons – Grow Them Indoors! Everyone loves houseplants – they provide greenery and pops of color to your home. Sometimes it’s fun to switch things up a little bit. Growing citrus indoors is actually easier than you think! Unless you live in a warm climate year round, growing citrus outside can be tough. Bringing it indoors will keep it at the temperature it needs and gives it a chance to thrive. Just imagine seasoning your salmon on a chilly night, adding fresh lemon to your water, or making a natural cleaner and being able to grab citrus right out of your living room to do it! And Meyer lemon trees smell so good too! If allowed, citrus trees will grow incredibly tall. Keep citrus trees from hitting the ceiling by choosing a container that is deeper than it is wide. This will help roots to grow down and not out, keeping the tree balanced as it grows. If the tree will stay in one well-lit area year-round, any container will do. If you are moving it from room to room to follow the sunlight per season, a thinner plastic container is lighter and easier to transport. Make sure your container has adequate drainage holes. Citrus trees don’t like wet feet. A light well-drained soil mix, such as Espoma’s Cactus Potting Soil, works best to grow your tree in. It provides the tree with enough water to keep it happy and allows the excess to drain quickly. Fill your container with just enough soil so your root ball is just under the lip of the container. This helps your tree to get the right nutrients and drain correctly. Before placing the root ball in the container, be sure to sprinkle Espoma’s Citrus-Tone on your soil as directed. Center your tree’s root ball and fil the sides in with soil. Tuck the soil in the sides, so the tree doesn’t lean. Feed your tree regularly to ensure successful and juicy citrus. Citrus trees require 8-12 hours of sunlight a day. Be sure to choose a south-facing window with good airflow. In the winter months, you may need to supplement with a grow light if there isn’t enough daylight. While citrus trees don’t like their feet wet, they also don’t like to dry out. If the first inch of the soil dries out, be sure to water your tree. If you water about once a week, you should be using around ¼ of a gallon. If the tree is standing in drainage overflow, be sure to allow it to dry before watering again. Do you have outdoor trees that need to be fertilized? Watch this video to learn how! https://www.espoma.com/wp-content/uploads/2018/01/meyer-lemon-tree-citrus-.jpg 667 1000 Jourdancole https://www.espoma.com/wp-content/uploads/2018/11/espoma-organic-logo.png Jourdancole2018-01-03 16:18:412019-01-31 13:09:36When Life Gives You Lemons – Grow Them Indoors! Laura from Garden Answer gives her best tips for caring for everyone’s favorite holiday plant – the Christmas cactus. These plants can live for year’s with the right care. Learn how to keep your Christmas Cactus blooming! Laura from Garden Answer shows you how to bring the outdoors in for the winter months. Make this easy potted plant snow globe using succulents and Espoma’s organic cactus mix. Ask kids to help make these tiny globes or make them yourself. They’re perfect for holiday decor or to give as gifts to the plant lover in your life. Gather your winter crafting materials, paint, potting soil, globe ornament, fairies, ribbons and succulents. Choose a small container such as a terracotta pot to serve as your base. Paint container and let dry. Tie a ribbon or string around the container and finish with a bow. Looking for more inspiration? Check out our YouTube page! Want to see more? Check out our YouTube channel! Get ready for fall by creating this seasonal planter filled with low light succulents, pumpkins and owls. Laura from Garden Answer explains how to create and care for a stunning low light succulent container! Be sure to use Espoma’s Cactus Mix and Cactus! liquid fertilizer. Want to see the full tutorial? Check out our YouTube Channel! Watch the quick version here!